Surprise!! We are new parents!!! 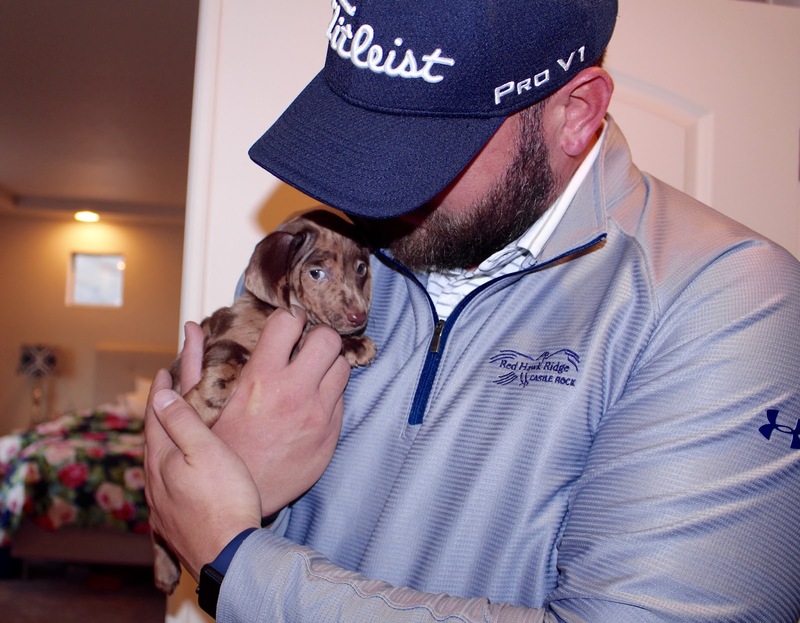 Let me introduce you to our bundle of joy………..
Elway is a mini dapple Daschund and his middle name is Austin because he was born in Austin, Colorado! 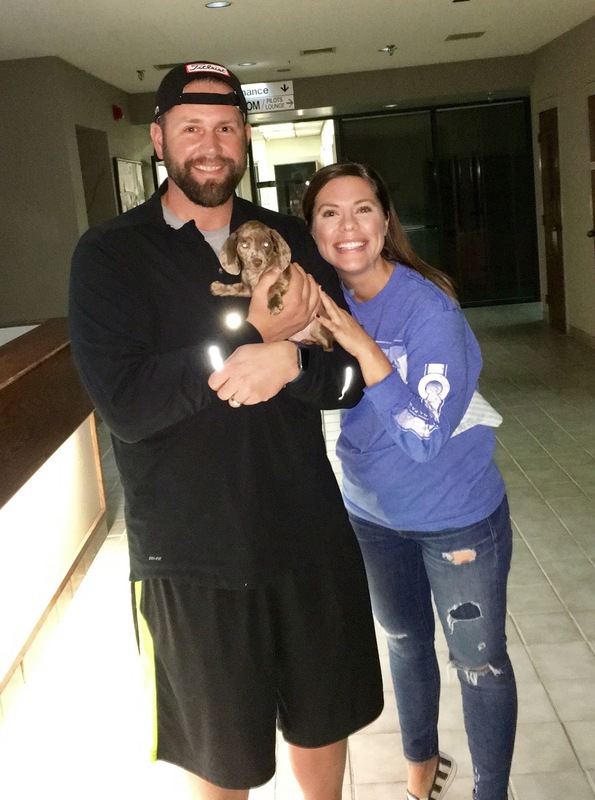 Elway was welcomed into our family last night at 7:45pm. Let’s back up and start at the beginning! 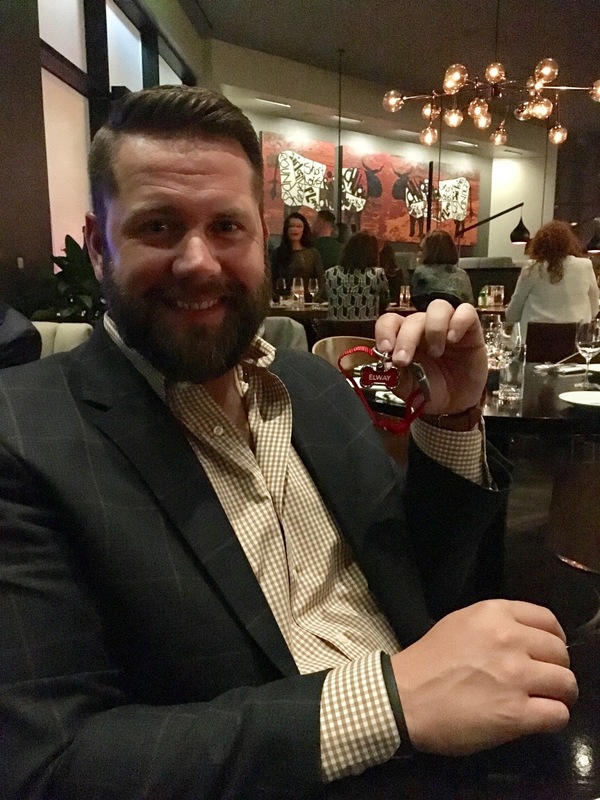 Elway is Matt’s Birthday present and at his Birthday dinner back in October I wrapped Elway’s baby collar with his name on it! And ya, keeping the secret was hard but I wanted a “true baby reveal” because …. why not! You know adding a new member of the family is a tough decision and he is in NO WAY a replacement for our beloved Oscar. But our other weenie Abner isn’t doing too well, and our Ralphie boy has never been alone…. so we needed to add the 3rd leg back to our dog tripod. 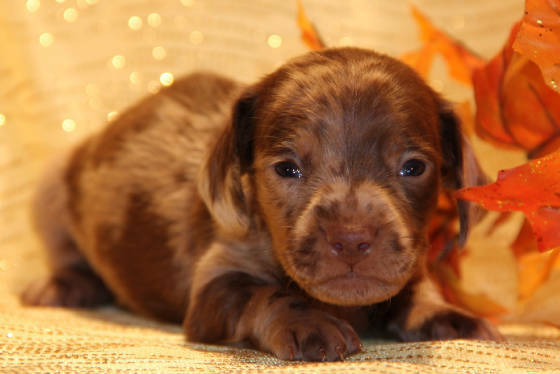 I was fine with ANY dog, are you kidding me… you know I will fall in love with anything but Matt was dead set on another weenie puppy and so here is Elway! Last night was the BIG arrival, we went to the Centennial airport to wait for our new babies arrival! And check out his ride, we had no idea he was riding in style A’la Jet service! But honestly it’s kinda sad, he was so worked up being on a flight alone…. first day away from his family and then he meets his new fur family. Poor baby was BEYOND worked up and he still is! Look at that little face, he is SO small! It has been 8 years since we had a puppy and I knew it was going to be a ton of work but OMG! We are 100% new parents. I was up all night with him and his lungs work great. Here is his newborn photo, he was 2 weeks old here….. little pumpkin! And now he is starting his life with us, just wait until he realizes he hit the jackpot of families! The coming weeks are going to be SO hard but eventually we will all meld together. Our biggest boy Ralph would you believe it or not is scared of him, the cat is NOT happy but our boy Abner is trying his hardest to welcome him into our family. It takes time. You know a TON of pictures are coming….. and I had BIG plans to do a whole newborn baby photo shoot with Elway but you guys getting a puppy to cooperate is NOT going to happen! I gotta go… he is crying his little eyes out right now. Congratulations!! He definitely hit the jackpot for sure, he will be in the most loving fur homes ever! His little 2 and 5 week photos are precious. I am sure he will be all set for a perfect Christmas family card photo shoot. OMG!!!! could he be anymore precious?!! He is so so cute! !